Provided one’s actions do not harm the rights of another, the belief in individual liberty and a right to a life of one’s own are core elements of the American Republic. The right to one’s own beliefs and spirituality and the use and enjoyment of private property are unalienable rights recognized in the Declaration of Independence and U.S. Bill of Rights. These unalienable rights are predicated upon the principles of Natural Law. The political establishment’s goal of globalism will obliterate political recognition of Natural Law. In its place will be a system of man-made law unbound to any sense of a higher or universal law. Hillary Clinton is a collectivist; a believer in strong central powers. Today she wants this centralization exercised on a hemispheric scale, later on a global scale. Wars, multinational trade, and a dishonest monetary system are prerequisites for implementing her program. Her plan is the plan of both parties’ establishment; to make America an outpost under a system of global governance. Donald Trump is unlikely to become a war hawk. He is opposed to multinational trade deals. But, if elected, he is likely to see massive monetary manipulation by the banking oligarchs, as they too seek the globalization of America. The election of Trump may result in the salvage of American ideals, but the election of Clinton will guarantee the loss of America. Recent leaks have shown that Clinton’s goal is globalization. She wants “open trade and open borders”, meaning the controlled (managed, not free) movement of people and goods across borders. This would be the end of sovereign countries. With that comes the centralization of power on a global basis. ‘Banana Republics’ arise when politicians pursue criminal activities on the theory that they are above the law. There is little doubt that Clinton has engaged in criminal activities, including the wanton mishandling of her State Department emails and the co-mingling of State Department business activity and the Clinton Foundation’s domestic and foreign contributors. Trump’s demand that Clinton be treated equally under the law does not make for a ‘Banana Republic’. It is her actions as a politician and her unaccountability to the law that evidences the lawlessness that makes for labeling the U.S. a ‘Banana Republic’. Should she be above the law? This is the real question faced by Americans. America has little experience with the depth of corruption that exists today. For at least 70 years, the politically ‘established’ have moved the United States closer and closer toward becoming a ‘territory’ of what George H. W. Bush called the “New World Order”. That trend may be changing. Most American people are beginning to acknowledge and reject globalism. This is evidenced by this season’s presidential selection process. The policies that underlie the grand transformation toward world government include managing people from the boardroom to the bedroom. Trade: Managed multilateral global trade agreements, such as the North American Free Trade Agreement (NAFTA), rule global economic patterns and outcomes. Multilateral agreements degrade national sovereignty. This is accomplished by establishing trade between nations with major philosophical differences. For example, multilateral trade agreements between low wage (often essentially slaved based) nations and the U.S. damages American productivity by sending jobs out of the country. The NAFTA agreement has destroyed domestic jobs and the tariff tax base in the United States. This destruction has occurred because trade policy must be conducted on a bilateral (not multilateral) basis in order to maintain American principles and national independence. Monetary Base: Beginning with the Bank of England in the 18th century, globalists have established an international monetary system. Organizations, including the International Monetary Fund (IMF), coordinate national fiat monetary systems. One such system is the U.S. Federal Reserve. Fiat money is made out of thin air by Central Banks. This small cadre of international banks then lends this funny money out to society. America’s nineteen trillion dollar debt is a result of this system. Because this debt is designed to be unpayable, it will lead to an implosion of the dollar and America’s well-being. This financial collapse will allow the international banks and their partnering elite to have total power over society. Technology: Today, modern technology provides data collection which tracks your money and movements. This technology could allow the government access to information that would give them the ability to form a post-modern dictatorship. Defense: The American military system is controlled by the politicians who are in turn controlled by those who direct the corrupt monetary system. Currently, the American military is directed to establish and maintain globalist objectives instead of to maintain the national defense. Eventually, the U.S. military will be replaced for economic or political reasons that better serve globalist interests. Neither the present nor future situations are congruent with true American values. By 2014, the ‘establishment’ was in control of both parties. They have pursued globalist policies – multinational trade deals, public-private partnerships, environmental land grabs, and massive government debt. In the process, private property is abolished. And Natural Law is vacated. Donald Trump is the first major party presidential nominee who has spoken out about globalist trade policy, including multilateral trade deals. If he means what he says and does something about trade, globalism will suffer a possibly terminal fate. No wonder the left and right wing establishments are in such frenzy. And why many Americans around the country are in such a surge. Freedom is predicated on principles not ‘deals’, so when it comes to public-private partnership deals, Trump appears to need help with America’s guiding principle. As an individual working with government, he believed he had the ability to move a widowed lady from her owned home so that he could build what he wanted in its replacement. Is it still true that he endorses the infamous Kelo decision [Kelo v. City of New London, 545 U.S. 469 (2005)] where the Supreme Court negates the principles of private property? This decision was lauded by the establishments’ liberal and conservative proponents of economic fascism. 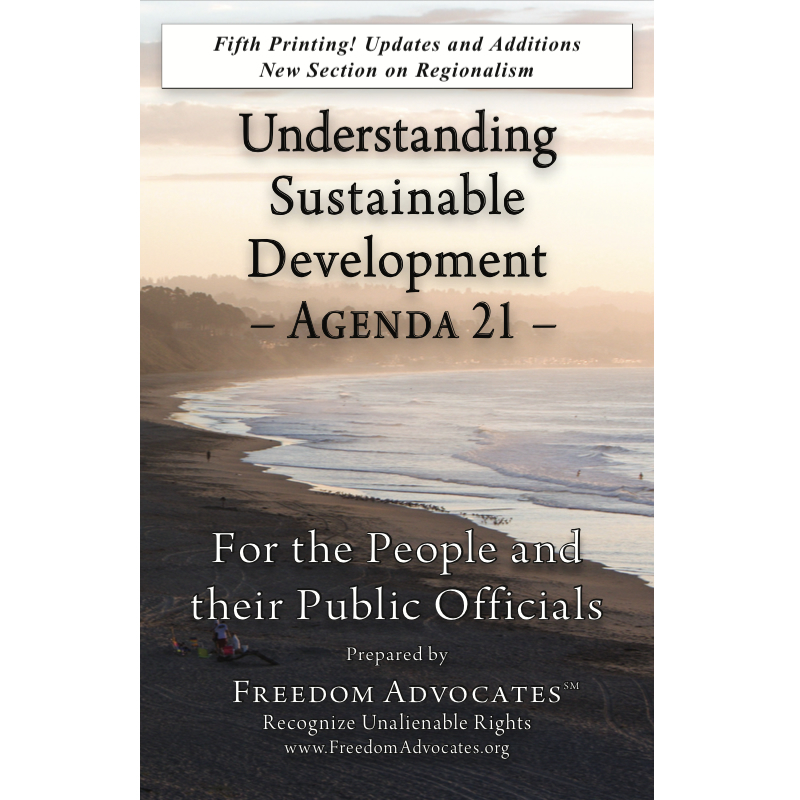 Has Trump publicly acknowledged the pattern of federal, state and local implementation of the internationalist Agenda 21 (2030 Agenda for Sustainable Development or Sustainable Development), which has now infiltrated every community in the United States? Sustainable Development directs American environmental policy and the ‘Smart Growth’ densification of our cities. Smart Growth puts the populace at risk through possible economic implosion, political unrest, and/or other contrived destructive measures. This circumstance would aid in accomplishing the globalist population reduction goals. Essentially, Agenda 21 implements the rapid collectivization of the American people. Connected to Sustainable Development is a movement which aims to ‘Regionalize’ our government through Councils of Governments (COGs). The insider regionalism craze is going on everywhere in America. A good illustration is the San Francisco Bay Area’s COG, the Association of Bay Area Governments (ABAG). ABAG is now implementing a $300 billion dollar government program called Plan Bay Area to redesign living (stack ’em and pack ’em) and transportation (public) in the Bay Area. Proponents of Plan Bay Area are calling for the Bay Area to have its own seat at the United Nations, claiming the Bay Area will become a ‘city- state’ region. For more information on the objection to Regionalism, see this case and this article. Trade policy is the cornerstone of the New World Order. The Common Market, the arrangement that governed European trade policy during the 1950s and beyond, led to the creation of the European Union (EU). The EU was intended to be the first of three international, regional, political unions. This is how society is arranged in George Orwell’s book “1984”. The North American Union (NAU) is planned to be the next formed region. This is what Hillary Clinton advocates for. Now that NAFTA is in operation, steps can be taken to implement the North American Union. However, if NAFTA is overturned, there will be no North American Union. Trump appears to not support NAFTA. If he is elected and follows through with what he says, world regionalism will have been blocked. Globalism will stagger. Globalism has started to be rejected. The United Kingdom’s Brexit vote withdrew them from the European Union. On a similar path, the election of Trump might return America to an independent trade policy. This would be a great start to restore American self-determination. We are on the verge of beginning a historic resurrection of American Independence. Our posterity is cheering. The evidence supports the idea that the real forces of freedom are rising!